As virtual care grows, integrated tools become a game-changer. Given the favorable regulatory changes, increasing reimbursement parity and technology breakthroughs over the last 24 months, many in healthcare are hailing 2018 as “The Year of Telehealth.” But Wendy Deibert, a 20-year veteran, bedside critical-care nurse who helped launch Mercy Health’s 350-bed eICU program, is making a bolder prediction: 2018 may be the year we stop differentiating telehealth, telemedicine and virtual visits from “traditional” in-person care. However one looks at it, the data show that after years of steady but unspectacular growth, telehealth is reaching a tipping point. Hanover Research, on behalf of Vidyo, conducted a survey in September 2017 of 300 nurses, physicians, healthcare administrators and IT professionals from healthcare organizations in the U.S. and Canada. The survey respondents hailed from a variety of healthcare organizations – 37 percent from 0-199 beds, 42 percent from 200-499 beds, and 21 percent from 500-plus beds. According to the survey, three out of every four healthcare delivery organizations are using telehealth solutions now or have plans to do so in 2018. And two out of every three provider organizations are spending 20 percent or more of their total technology budget on telehealth solutions. Those figures echo a 2017 study by KLAS and the College of Healthcare Information Management Executives, which found that nearly 60 percent of hospital CIOs surveyed planned to launch a telemedicine initiative or expand an existing program in a new service line. 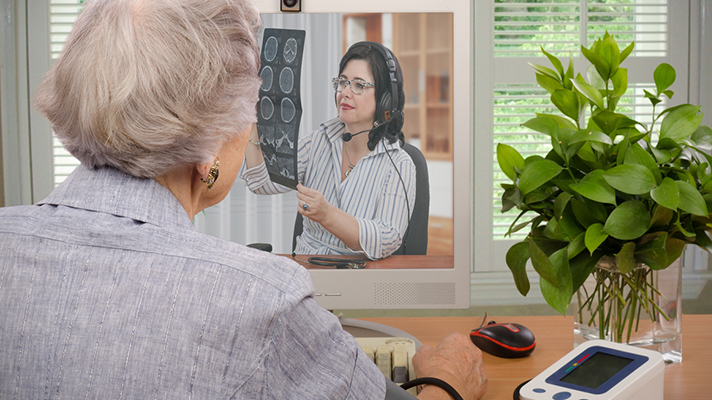 Virtual visits, in particular, are growing in popularity among patients, providers and caregivers. Deibert attributes that trend to existing consumer experience with devices and apps such as FaceTime or Amazon’s Echo Show, tools that make video-enabled calling as simple as pressing a button or telling a virtual assistant whom to call. According to the Vidyo study, providers see terrific value in video as well. More than three quarters of respondents believed that video empowered patients to ask questions about “small issues” before they blow up into major complications, built personal connections between care team members and patients ― and provided patients with care from any place, at any time. Equally important, virtual visits are improving the bottom line by helping hospitals decrease readmission rates, allowing physician practices to significantly reduce missed appointments, and improving the productivity of clinicians. Deibert agrees and recommends that providers look for telehealth solutions that can tailor video resolution to whatever endpoint is being used. Other factors that can improve a telehealth experience for clinicians include a single, familiar platform that can be used for multiple applications and specialties; tight integration to reduce the time lost switching between apps starting at and during the e-visit; the ability to embed telehealth video and data into other applications, especially the EHR; and high-quality tools such as video cameras and microphones that are integrated into computing devices. In other words, if telehealth becomes part of everyday healthcare delivery in 2018, the tools that enable telehealth should be built into everyday healthcare IT devices. Ideally, these devices will be optimized for video-conferencing and include features such as smart noise-cancellation to suppress background noise and improved voice quality (for example, via enhanced bass). Additional technology within the device should take care of network issues such as high latency of Wi-Fi congestion. The key, says Deibert, is to avoid the clumsiness of trying to retrofit telehealth-specific tools onto generic IT devices. “If you have to have a lot of extra tools to do this, it’s a challenge, and people aren’t going to be able to adopt as well,” she said. Vidyo study conducted September 2017, among 300 nurses, physicians, healthcare administrators and IT professionals from healthcare organizations in the U.S. and Canada. The study was not sponsored by HP Inc.